Basic and advanced system mechanics require only standard six-sided dice. Options include heroic characters, cinematic cliches, and diceless play with Active Exploits Diceless Roleplaying. Compatible with the Knuckleduster Firearms Shop. Focus stories in the booming town of Shady Gulch, located deep in the Black Hills of the Dakota Territory. Or create your own Wild West town or setting for a custom experience. Extensive information on the native tribes lets you play Indians or simply breather life into allies and enemies. 39 templates get you into the action quickly. 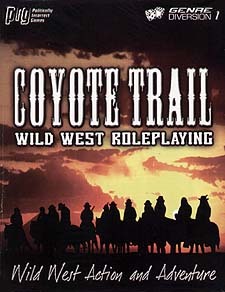 Play right away with ready-to-use cowboys, gamblers, lawmen, Indians, and other characters, as well as horses and wagons. 4 scenarios also help get you in the action quickly. Perfect for on-going stories or last-minute diversions from your other games.